3 large bedrooms all with sea views. Short stroll to restaurants and shops. In a convenient and commanding position, Villa Kahili is built and maintained to an exacting standard. This spacious and private villa is set against the backdrop of the magnificent Taurus mountains and has superb unobstructed views of the bay and islands. With substantial room sizes, beautifully furnished, the villa has a light and airy feel. Accommodating six people in style. It has an emperor-sized master bedroom with en-suite contemporary bathroom, a twin-bedded room with en-suite shower room and, on the ground floor, a large king sized bedroom and shower room. All bedrooms have a balcony or terrace and have uninterrupted sea views. A fully equipped open plan kitchen adjoins a spacious lounge which leads out onto the terrace. The infinity pool is set in landscaped gardens complete with a shaded pergola. This is a beautiful villa for both families and couples in a quiet location yet only 5 minutes walk from Kalkan's renowned restaurants and shops. for more photos and details of the villa and contact information visit our villa kahili web site. Transfer and Car Hire: Flights to Dalaman are from most UK airports. The journey to villa Kahili from the airport is a pleasant scenic drive taking about 1hr 30mins. We can assist in organising transfers from the airport to the villa or car hire as needed. We use Xpress Tours, a Kalkan based company. For transfers a representative will meet you at the airport and drive you directly to the villa in a private air conditioned taxi or mini bus - dependant on the size of your party. Transfer costs range from £110 -£140. Car hire £27 - £60/day. On the terrace there are six wooden sunbeds and three large umbrellas, outside dining is under a covered pergola set in a garden with banana and jacaranda trees. On the ground floor the spacious lounge has patio doors which lead directly to the pool and terrace. The adjoining kitchen has marble worktops and breakfast bar with dishwasher, extra large fridge/freezer and full sized oven and hob. In all the bedrooms the furniture is hand-made lime-washed wood. Each bedroom has a large wardrobe, dressing table with mirror, hair-dryer and individually designed wrought-iron bed heads. Second floor a small utility with washing machine, iron and ironing board. A large roof terrace with dining table and chairs. Marble and tiled floors throughout and mosquito nets on the windows. Safe. The decor is elegant and furnished to a high standard. It is in a prime location which gives it wonderful views from all rooms and yet it is in easy walking distance of all the shops and restaurants. I can thoroughly recommend Villa Kahili with its amazing views, very well equipped, the location is ideal - nice and quiet but not far from town - bit of a hill to get back but then so is everywhere in Kalkan!! Garden and pool area is lovely and private - bedrooms amazing (especially master suite) - will definitely return. Thank you Sheila for letting us stay in your wonderful Villa Kahili. This was the best villa we have ever stayed in, lots of space, tastefully decorated, good location, fantastic outside space and pool. A 10-15 min walk down to the harbour, less to nearest shops and restaurants, a steep hill so for me a taxi back to the villa after the evening meal 10-12tl. We hired a car for convenience but local transport is very good and a car is not essential. Sheila arranged transport to and from the airport and hire car, this was very helpful and everything went perfectly. Cleaners come twice a week, pool/outside cleaned daily, all lovely people, polite, friendly and unobtrusive. Kalkan is a lovely town, the villa perfect; we didn’t want to leave and hope to return. Two weeks of relaxing in a lovely location. Thank you very much for taking the time to write the review. It is really good to hear that you enjoyed your holiday and that the villa and Kalkan was all you wished for.We would be very pleased to welcome you back to the villa in the near future. Beautiful villa Kahili is situated close to the centre of Kalkan - the restaurants and bars are in walking distance however you might want to get a cab back as the walk is uphill on the way home. 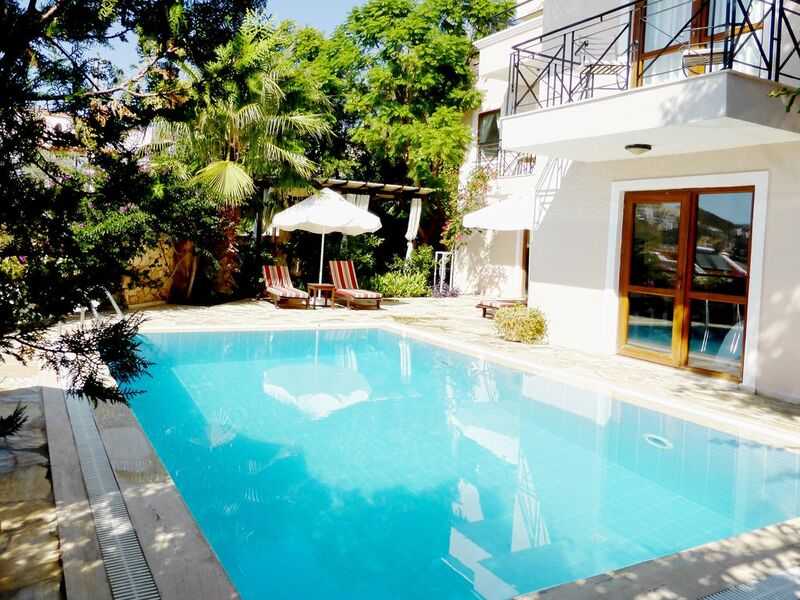 The villa has a good size infinity pool situated in a well kept garden with lots of plants and flowers along with a shaded patio area - great for lunch and a break from the hot Kalkan sun. We would definitely use Villa Kahili again - it is a superb villa. This place has it all, best villa I have been to. It has everything you could possibly need, a fantastic private pool with south facing sun trap for day round sun. The area by the pool was so good that most days we just relaxed by the pool. The local beaches were fantastic, recommend Kaputas beach just down the road. We enjoyed cooking at the villa, has all the mod cons and equipment you need, also gave the bbq a spin. Sheila was a brilliant host, everything was sorted for our stay, wouldn't hesitate to stay here again. We'll be back! Loved the villa. Great views and lovely to relax by the pool on the sun loungers. If you a sun worshiper- you are able to get the sun from sunrise to sunset. The villa has various books and magazine to read by the pool, and if you want a night in you can just watch a DVD and cook a lovely meal. The town is 10 minutes away from the villa and has numerous restaurants and shops- you will be spoilt for choice. The historic little port of Kalkan is one of the most attractive locations along Turkey's renowned Turquoise Coast. The Taurus Mountains surrounding the area provide a dramatic backdrop of considerable geographical interest and beauty. Kalkan is a small yet unique harbour town with unrivalled charm and character. Walking through the maze of cobbled streets lined with historic Greek and Turkish buildings covered in bougainvillea, soon reveals why Kalkan and its freindly people attract the discerning. Renowned for its moderately priced high quality restaurants, dine in the roof top restaurants, listen to live classical/jazz music, relax and enjoy the views. Wander past charming boutiques or through the local market - there is plenty to absorb. Kalkan has an attractive pebble beach, or visitors may choose to visit Patara beach (20kms of sand) 30mins away. Kaputas cove, a secluded beach at the foot of a ravine is only 5 mins away. There are many classical sights all within easy reach.